Sarah Needleman wrote another great article in today’s Wall Street Journal, see below. While she covers a lot of points that are valid, the one I really relate to is the “TTM” disorder. As in “talks too much”. In interviews, as in sales calls, you need to think about what you are trying to communicate and put together some supporting detail. There’s certainly no bonus points for excessive word count. The candidate who prepares for the upcoming interview and what questions may be asked and how best to answer them generally comes off strong. Too many candidates are hyped up in the conversation, are not self aware as Needleman points out, and ramble on. Lay off the double shots, take a deep breath and leverage your preparation. Last summer, Lisa Harrell interviewed a candidate for a director job who offered a list of impressive accomplishments. But during the 60-minute meeting, the Ivy League candidate never paused long enough for the recruiter to ask just how he executed on them. “In the end, he took a breath and said, ‘After my first 90 days, what is my next step? '” recalls Ms. Harrell, vice president of human-capital development at UnitedHealth Group Inc. in Minnetonka, Minn. His bravado cost him the job, she says. When it comes to self-promotion in the workplace, hiring managers say some people go too far and block their path to the next level. You might call them the corporate world’s “American Idol” wannabes. Like many contestants on the reality TV show who extol the greatness of their singing abilities and then end up sent home, corporate idols sing praises about their abilities without delivering tangible evidence to back up the claims. And recruiters and employers say they’re seeing the behavior more frequently in the current bad economy, as some candidates try harder to impress interviewers and workers go out of their way to hang on to their jobs. “A lot of people are selling themselves hard,” says Mark Angott, president of Angott Search Group, a recruiting firm in Rochester, Mich. Out of desperation, many job hunters convince themselves they’re qualified for positions that don’t match their backgrounds, he says. “They want to try anything and everything,” he says. And recruiters and employers say they’re seeing the behavior more frequently in the current bad economy, as some candidates try harder to impress interviewers and workers go out of their way to hang on to their jobs”A lot of people are selling themselves hard,” says Mark Angott, president of Angott Search Group, a recruiting firm in Rochester, Mich. Out of desperation, many job hunters convince themselves they’re qualified for positions that don’t match their backgrounds, he says. “They want to try anything and everything,” he says. And like “American Idol” rejects, corporate idols who lack the skills and knowledge they claim to have often handle criticism or rejection poorly. “We’ve had guys use every expletive in the book,” says Dave DeMink, an executive-search agent in Roseville, Calif., referring to the reactions he has received from job hunters he has declined to present to clients. 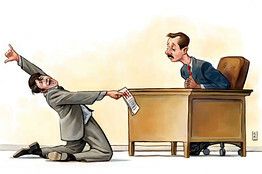 In more robust economies, some corporate idols take their cockiness to extreme levels by demanding above-average salaries, custom job titles and other forms of special treatment. Consider, for example, the candidate for a senior communications job who told New York recruiter Bill Heyman that he would accept the role only if he would report to the large company’s chief executive officer. The position reported to the head of human resources, and Mr. Heyman strongly urged the candidate “to play by company rules.” Ignoring the recruiter’s advice in an interview with the employer, the candidate lost out on the job, he says. An unwillingness to accept help from a boss or colleague is another sign of a corporate idol. Case in point: When Lee B. Salz was a vice president at a small outsourcing company, he says, an employee who reported to him repeatedly turned down his offers to show her ways to improve. “She thought she knew everything and [in reality] she wasn’t that good,” recalls Mr. Salz, now president of Sales Architects, a sales-management consulting firm in Minneapolis. What causes these unaware workers’ heads to swell? According to Brooks Holtom, an assistant professor at Georgetown University’s McDonough School of Business, employees in certain fields like customer service have no solid way to measure their performance. By contrast, sales professionals can add up the revenue they generate and compare figures over time. As a result, some people are more susceptible than others to developing false impressions about their skills, he says. Poorly designed reward systems are sometimes to blame for overinflating egos, says Roy Saunderson, president of Recognition Management Institute, a New York provider of workplace-consulting services. “If you read the criteria, they’re so loose, almost anyone can get” rewards, he says. Likewise, it can be advantageous for job hunters to engage in a little spin-doctoring to show recruiters they’re confident in their ability to handle a position, say career experts. But it’s also critical to demonstrate modesty. UnitedHealth’s Ms. Harrell says she hired a director last year who described himself as a technically competent leader and provided two detailed examples to illustrate his point. “He showed that he could efficiently instill a vision and accomplish major tasks, and whether he did them himself or through other people,” she says. Giving credit to others and showing his team mentality helped seal the offer.